As you may well have noticed it’s been quite a while since my last blog post, mainly because WZ507 has had a very quiet year. We have struggled to obtain air show bookings and have also suffered from various technical issues which have prevented us from displaying. 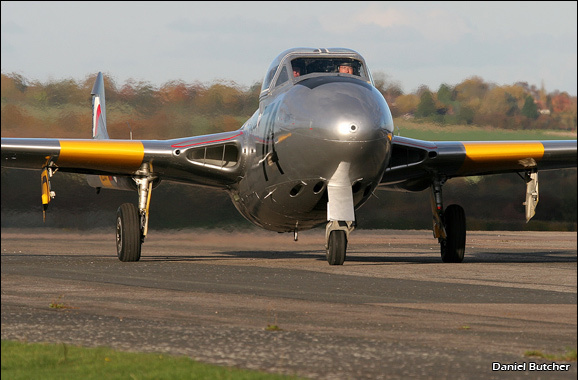 The Vampire is currently grounded, pending the annual maintenance inspection early next year; we anticipate that flying will resume again in April 2013 ready for the air show season. We have already secured a booking for Shuttleworth on 16th June and as ever, negotiations are ongoing regarding other displays - with any luck, WZ507 will be much more prominent next year! There was a long-awaited announcement from Airfix this week on Wednesday - they are releasing a 1:72 scale model kit of WZ507 in February next year! This kit was conceived two years ago and after a lengthy research and design period it is finally ready for production. 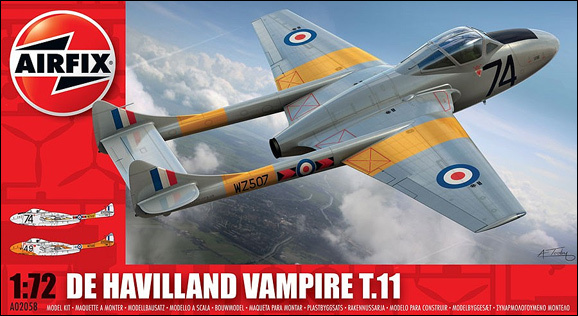 This kit should build into a very accurate and detailed model of our Vampire T11 and is a welcome addition to the Airfix range. To pre-order this delightful kit, please visit our online shop. 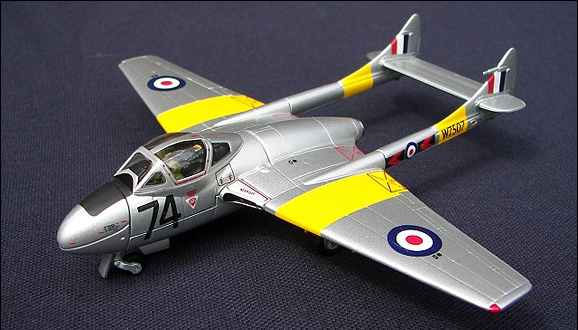 All proceeds from our online store are used to help keep WZ507 flying, so purchasing your Airfix model of WZ507 directly from the Vampire Preservation Group can really make a difference and preserve WZ507 for future generations to enjoy. With just a week to go until Christmas, the traditional reminder that membership of our Supporter’s Club makes an ideal present for an aviation enthusiast. For more information or an application form, please visit http://www.vampirepreservation.org.uk/supporters.htm. A new membership can easily be actioned by Christmas, so it’s not too late for a last minute gift subscription and your support would be hugely appreciated! Thank you to everybody who has supported WZ507 during this difficult year; hopefully 2013 will be much more successful and we will be displaying at a venue near you! It's been a quiet few months since my last update on UKAR, mainly due to poor weather and serviceability issues with the Vampire. We did however manage to complete a series of successful flights with WZ507 to test the new engine and everything went well. If anything, the new engine seems to be producing more thrust than the old one - during the test flying it was noted that both acceleration and rates of climb are measurably more impressive than before, which is an unexpected bonus. The technical issues have all involved the nose undercarriage. Some of the bolts that attach the nose leg to the fuselage were replaced due to corrosion; the nose tyre was also replaced at the same time as it had worn to limits. During this work the engineers noticed excessive play in the nose leg linkage; this is currently being investigated and rectified. At the beginning of the month WZ507 went into the hangar for its annual inspection. This is progressing well, although a few other minor issues have been discovered. This is not unexpected - every year small defects are found and rectified - the whole point of these inspections is to pick up any potential problems and fix them before they become serious. Hopefully WZ507 will be airworthy again in June and we can look forward to returning back to the display circuit. Several display bookings are in discussion and we will hopefully be able to announce some dates and venues soon! 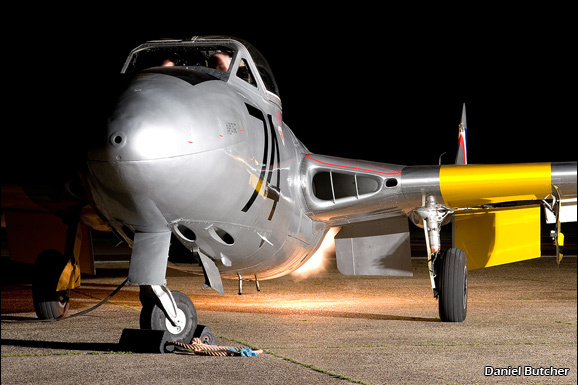 With annual servicing underway, the Vampire will hopefully be back in the air by mid-June. As you have probably seen elsewhere on UKAR, their downloadable podcast service has just been launched. This is a great new addition to the UKAR website which will hopefully really take off… On the initial podcast there is a contribution from myself with an update on WZ507, including more news about the recent maintenance issues. You can listen to the podcast online by clicking here. There is also more information on the news page of the VPG website. Hopefully WZ507 will be gracing the skies of an air show near you later this year. If you do see us, don't forget our annual photo competition. Send us your pictures of WZ507 in action and you could win a flight in this historic aircraft - good luck! WZ507's engine change is now complete and we have made our first flight with the new engine - everything went well with no major issues. A series of further test flights will now take place, checking for any potential problems and ensuring all is well with the new engine before resuming display flying in the New Year. An in depth article about the engine change will shortly appear on our website, complete with pictures and more information about the work carried out. 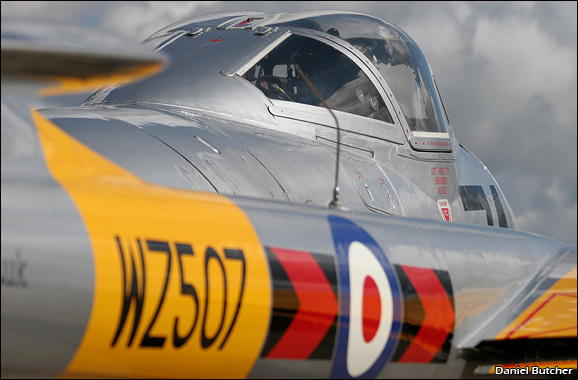 We are delighted to announce that WZ507 has a sponsor for the 2012 display season. Aerobytes Limited, a company that provides flight data monitoring systems for numerous airlines, has agreed to become our main sponsor for next year's display season. We would like to thank Aerobytes for their invaluable assistance with helping to keep WZ507 airworthy and look forward to a much busier display season next year! Due to the limited number of flying hours available to us this year with the old engine, we have had a greatly reduced flying programme and WZ507 has only appeared at two display venues during the whole of 2011 - Southend and Sunderland. Consequently we have decided to extend this year's photo competition until November 2012 to give more people a chance to see the aircraft. WZ507 appeared at North Weald's "Flight Night" last weekend so hopefully we will see some dramatic images from this event soon! 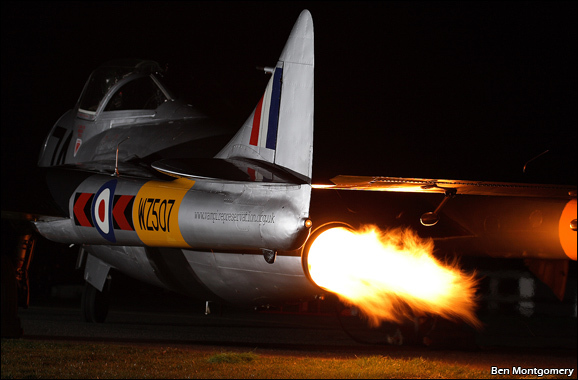 WZ507's new Goblin engine spitting flames on start up at the North Weald 'Flight Night'. Finally, the traditional Christmas plug... Are you struggling to find a suitable Christmas present for an aviation enthusiast? If so, maybe they would like to join WZ507's supporters' club? Club members receive regular newsletter updates about WZ507 and can access the "members only" section of our website which contains exclusive pictures and video of WZ507. For more information, please visit vampirepreservation.org.uk. After years of (usually!) hassle free service, the Goblin engine in WZ507 has finally come to the end of its life. The final flight with this engine was on 31st July, returning to North Weald after displaying at Sunderland International Air Show. On the 1st August work started to remove the engine and replace it with another one which has just been overhauled. But what is involved in a job like this? 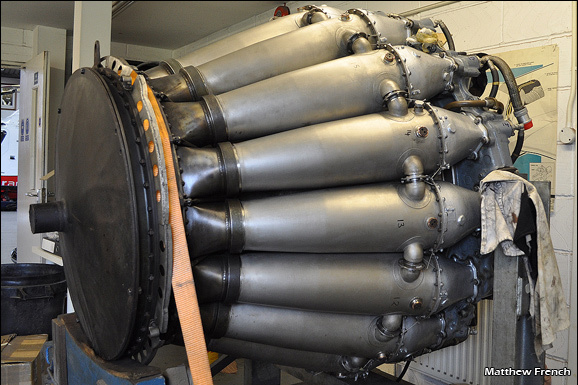 We took delivery of the replacement engine at North Weald earlier this year and a major inspection was initiated. This included stripping down the engine, carrying out tests on various components, checking for corrosion and damage, servicing ancillary equipment and then re-assembling the engine. This work was completed several weeks ago, to make the new engine as ready as possible for installation. WZ507's new Goblin engine awaiting installation. The engine change has only just commenced and we do not know if any problems will arise. The intention is to remove the existing engine and transfer several items onto the replacement engine, for example, the hydraulic pump and ignition system. Once the new engine is 100% complete it will be fitted into WZ507 and ground running will begin. If this is satisfactory, flight testing will follow shortly afterwards and we hope the Vampire will be fully airworthy again later this month. The replacement engine has very few hours "on the clock" and should have enough life in it to keep WZ507 flying for another thirty years. The current engine will be kept and used as a donor for spare parts. As you can imagine, this is a major and expensive process and we are now raising funds in order to complete this task and keep WZ507 airworthy. If you wish to help you could do so by joining our supporters club, purchasing items from our online shop or even sponsoring the aircraft or donating to the organisation. All contributions would be greatly appreciated - please visit the Vampire Preservation Group website and help us keep the Vampire flying. We will also post an update on our website soon with more news and pictures showing the engine change. Thank you for your support, it is appreciated. 2011 has been a disappointing year so far. WZ507 has only made two flights, although fortunately these were both problem free - always a relief after a long period of not flying! On 27th March we participated in the inaugural North Weald night photo shoot; this seemed a good time to also launch the 2011 VPG photo competition. Unfortunately only one photographer has so far submitted any photos from this event; hopefully more pictures will be forthcoming soon as there must have been hundreds of images taken that night by some very experienced photographers - it would be great to see some of the results! With spare brake parts now located, the VPG's season can take off at last! Annual maintenance began the day after the night photo shoot and was scheduled to be completed by mid-April. However, this was not to be and work is still ongoing due to a problem with the Vampire's brakes. As a result of this delay, we reluctantly had to cancel our appearance at the Abingdon Air & Country Show last weekend - a great shame, as it is always a pleasure to display at this venue. Fortunately we have now located the spare part we need and hopefully the Vampire will be airworthy again later this week. The season ahead is currently a little quieter that usual, but negotiations are progressing well with several display organizers and hopefully the display diary will become as busy as usual. More details about our airshow appearances can be found on our website. Time for my final round-up of news for 2010. Firstly, our annual competition results. We've had another year of excellent pictures, with some interesting compositions - it was good to see some more unusual angles of WZ507! In first place, with a unanimous decision from the judging panel, Paul Brennan's striking image of WZ507. The judges were impressed by the precise focus and atmospheric use of sepia, which increases the effect of the clouds in the background. They particularly liked the contrast between the symmetry and bold lines of WZ507 in the foreground and the soft and disordered appearance of the clouds behind. Congratulation to Paul, who has won a flight in WZ507 and our thanks to everybody who contributed to this year's competition. Finally, no Christmas blog would be complete without a reminder about our Supporter's Club. Membership costs from just £1 per month (although larger donations are greatfully accepted!) and your support helps us to keep WZ507 flying - this would make an ideal gift for any aviation enthusiast. 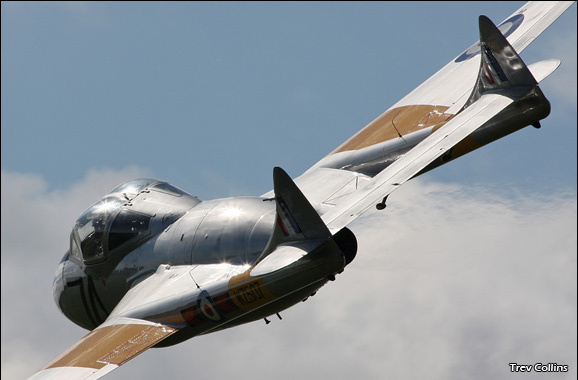 We may not have such a high profile as some other aircraft on the preservation scene, but the Vampire is still a popular aircraft at airshows and we intend to keep this aircraft flying for the foreseeable future. Club members receive a quartly newsletter about our activites and have access to a dedicated "Members Only" section on our website, containing photographs and HD video of WZ507. If you would like to join, more information is available here. Our sincere thanks to everybody who has supported WZ507 this year - hopefully we will be appearing at an airshow near you during 2011! It's been a while since my last update, so here's a summary of our activities over the past few months. The airshow season is now well and truly over, but 2010 has been our busiest year to date. 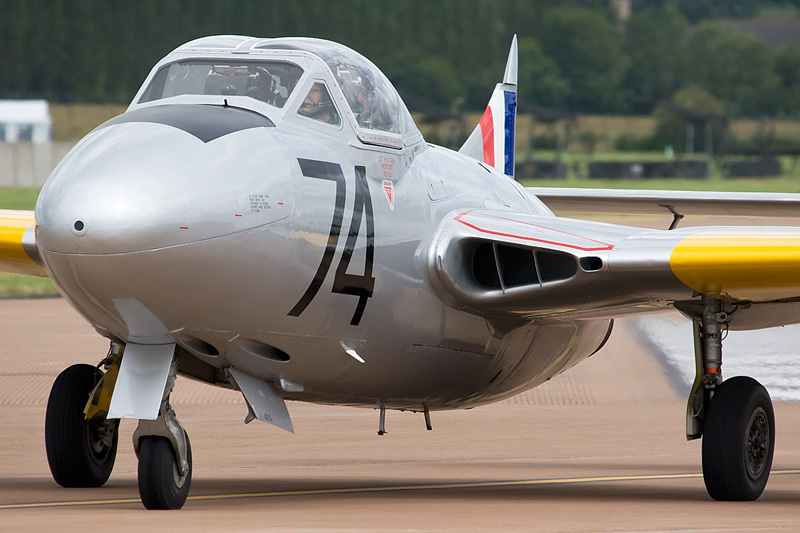 The Vampire flew to Edinburgh in July, in order to appear at the East Fortune Airshow. This was the first time the Vampire has displayed at this venue - we were invited to display in 2008, but poor weather forced a last minute cancellation - one of the perils of a UK summer...! We were also booked to appear at Leysdown Airshow on the Isle of Sheppey during the same weekend. However, upon returning to North Weald the Vampire developed a technical fault which prevented the aircraft from flying. This was rectified over the next few days; it was very fortunate for us that this problem did not occur in Edinburgh, as getting the engineers to Scotland would have caused the repair to take longer and have cost significantly more to achieve. WZ507 made appearances at Shuttleworth and Eastbourne on 15th and 16th August. The following weekend was expected to be the busiest of the entire year, with displays booked at Bournemouth, Shoreham and Sywell. Atrocious weather along the south coast forced cancellations at the first two venues; Sywell had far better conditions and enjoyed an excellent display by Mark Hooton. Our last display in August was at Little Gransden which went ahead without any problems. Displays took place at Seething and Kemble in September, including a flying visit (pun intended!) to Filton for an appearance at Airbus' Family Day. All in all, a very sucessful season and plans are already underway for 2011! The annual VPG photographic competition deadline is fast approaching. If you have any pictures you wish to submit, please ensure they reach us by 7th November. To see a selection of photographs that have been short-listed, please visit our newly updated website. It was intended to host another VPG Open Day on 31st October. Unfortunately work commitments have prevented this from going ahead as planned, but we intend to hold another event in the future. Do you have any views on what you would like to see? Open Day reports are available on our website to give you an idea on what we have done for past open days in 2008 and 2009. If you have an idea or want to see something different, please let us know by leaving a comment on the VPG Blog thread. That's it from me for now - more blogging soon! It's been a busy year already, with several more displays still to go! 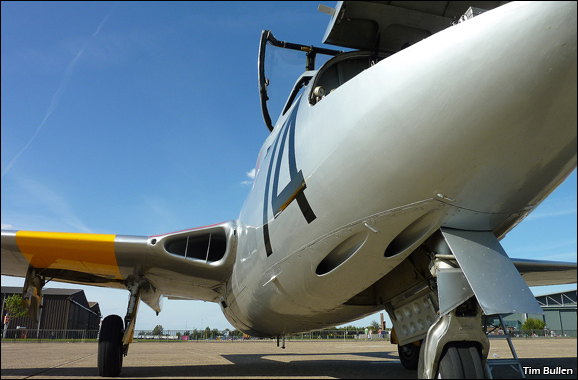 Our season started on 25th April, at North Weald's Gathering of Veterans and Warbirds. WZ507 made two flights that day - the first with Ben Montgomery, the winner of the 2009 VPG photo competition. The morning was overcast and damp, but the sun eventually broke through and Ben's flight was underway. 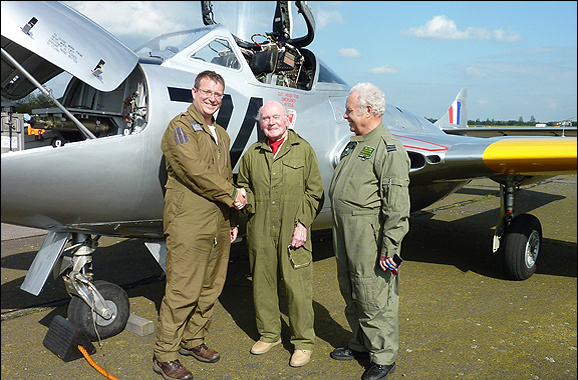 The second flight was with Bill Green, a former Battle of Britain Hurricane pilot. Bill had just celebrated his 93rd birthday and was keen to sample his first flight in a jet, an experience he thoroughly enjoyed! We also launched our Facebook page at the end of April, which is intended to provide the latest information about WZ507's displays, as well as giving people the chance to post comments about our activities. To see the page and join in, visit Facebook, search for "Vampire WZ507" and press the "Like" button. The first display of the season was at Abingdon on 2nd May, although due to a late decision by the airfield owners, no fixed wing aircraft were allowed to land. It was a day of appalling weather, with strong winds and rain all morning. Fortunately the weather improved by the afternoon and WZ507 flew in from North Weald and displayed as scheduled. The next display was a last minute booking for Southend on 31st May, due to another aircraft cancelling with technical problems. Not the best weather, but quite sufficient for putting WZ507 through her paces! The Vampire made a visit to Casement Aerodrome, Baldonnel on Thursday June 3rd for a reunion of the Irish Air Corp. We had also been booked to appear at Airshow 100 the following weekend, an event to celebrate 100 years of Irish aviation. Sadly this event was cancelled due to funding issues. WZ507 was back in the UK for a Families Day at Northolt on 13th June. The following weekend was a busy one, with displays both days at Kemble and a display at Margate on Sunday. It was another weekend of mixed weather, cloudy on Saturday but sunny on Sunday. All displays went well and because of the good weather we finally received some pictures for this year's photo competition - the VPG website will be updated soon with a selection of your entries. Waddington was a disappointment this year - we were booked to attend, but the booking was subsequently cancelled. We were also requested to display at Yeovilton, but despite attempting to contact the organisers on several occasions, this booking never materialised. WZ507 displayed at Chelsfield on 10th July, a new venue for us and one we hope to repeat in the future. Still to come later this year are confirmed displays at East Fortune, Leysdown, Shuttleworth, Sywell, Shoreham and Little Gransden. Other venues will hopefully be added to the list soon. It's a busy year! The 2010 VPG photographic competition has now been launched! This competition has been running since 2006 and the standard just gets better and better - we're really looking forward to seeing what pictures we get this year! As before, the prize for the winning photographer is a flight in WZ507, so send us your best shots and you could be joining us for the experience of a lifetime! Last year's winning photograph was the first one submitted, taken at our 2009 Open Day. Ben Mongomery's superb picture of WZ507's night start-up was the unanimous first choice of our judging panel - hopefully Ben will have his flight in our Vampire this weekend. Please scroll down to my blog entry on 6/11/09 to see Ben's winning picture, along with last year's runner up pictures. 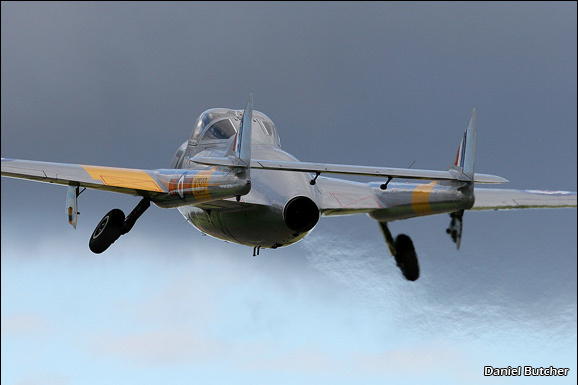 WZ507 is appearing at numerous air shows around the UK during the year, so you should get plenty of opportunities to photograph our Vampire T11! We will also be very active from our base at North Weald, so you may see us there - especially this Sunday at the Warbird Gathering - we are expecting a busy day with several Vampire sorties planned! For a full list of display flights please visit our website. The competition starts this Sunday and the closing date for all entries is 7th November 2010 - results will be announced on our website two weeks later. To be in with a chance, photos should obviously be of a good technical quality. 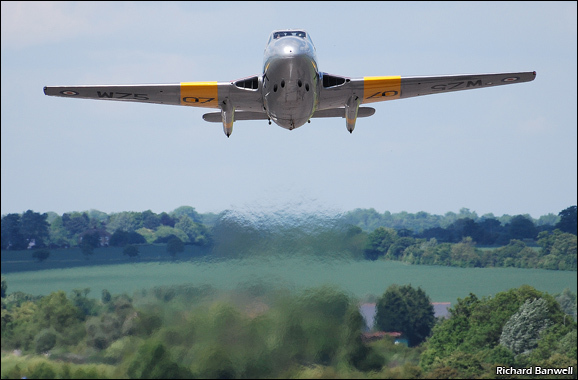 Quirky or unusual shots also tend to stand out - two out of the three photos short-listed from 2009 were static shots of WZ507 taken on the ground, as was the 2008 winner - it isn't necessarily the airborne photographs of the Vampire that win the prize! Full competition terms and conditions can be found on our website - good luck! Please Excuse This Cheeky Plug...! Struggling to find a suitable Christmas present for a fellow aviation enthusiast? Maybe somebody wants to buy something for you, but you've run out of ideas? Maybe we can help...! As you can imagine, operating a vintage jet such as the Vampire involves a major financial commitment - paying for maintenance, hangarage and insurance costs thousands of pounds every year. The Vampire Preservation Club was formed to help us keep help keep WZ507 airworthy - anybody who wishes to help support our efforts may join the club. Membership starts at just £1 per month and all income is used to contribute towards the Vampire's running costs; everybody involved with operating this aircraft is an unpaid volunteer. We have deliberately kept the cost of joining the club low, so that it is an affordable option for almost anybody - after all, what else can you buy with £1 per month? Subscriptions may cost less than half a pint of beer or a loaf of bread per month, but if 100 people join the club it makes a massive difference to the funding of this unique aircraft. So what do you get for your monthly £1? Every member receives our quarterly colour newsletter and invitations to any club events that we organise, such as the annual Open Day. In the near future we will also be launching a 'members only' section on our website, which will feature exclusive HD video clips of WZ507, including cockpit footage taken during Shoreham airshow this year - not to be missed! 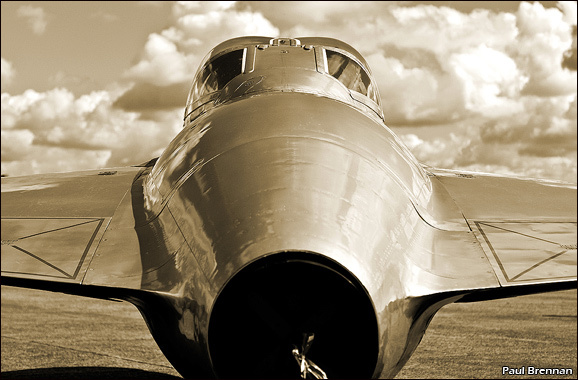 If your monthly donation exceeds £5 per month, you will also receive a free gift and the opportunity to join us at North Weald whenever we are flying the Vampire for a guided tour around the aircraft with one of our pilots or groundcrew. To join the club, please complete the standing order mandate. Payment for all items is made using a secure credit card or Paypal account. Please click here to see what we have to offer. Please note - all orders received by Tuesday 15th December should be posted in time for Christmas, after this date we cannot make any promises...! Merry Christmas to all our supporters; thank you very much for your valuable help and we hope that you see WZ507 at your local airshow in 2010! A stunning picture and a worthy winner. Thank you to everybody who submitted a picture and congratulations to Ben - we look forward to seeing you soon for your flight in the Vampire! Details of next year's competition will be announced early in 2010. For anybody who hasn't heard of the Vampire Preservation Group, here's a little background information about us (if you already know about who we are and what we do, please skip the first paragraph!) More details about our activities can be found on the VPG website. 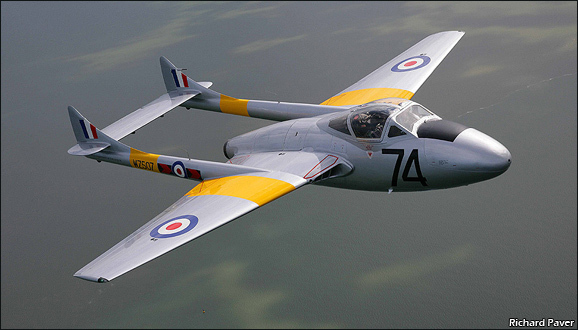 The VPG was formed in 2005 to operate WZ507, a de Havilland Vampire T11 built at Christchurch in 1952. WZ507 served with 229 OCU Chivenor, 8 FTS Swinderby, 5 FTS Oakington, 3 CAACU Exeter and finally CATCS at Shawbury, before retiring from RAF service in 1969. In 1980 this aircraft became the first ex-RAF jet fighter to be put onto the UK civilian register (as G-VTII), after being restored by the Solway Aviation Society at Carlisle. Since then it has been based at both Cranfield and Bournemouth, before moving to its current home at North Weald in 2006. One of our major aims is to display this unique aircraft at air shows around the UK - and beyond! 2009 has been a very successful year for us; the season started with our annual Open Day at North Weald in March. Despite being grounded by a brake failure this was a very memorable event, including a night start up of the Vampire's Goblin engine and a fascinating talk by Captain Eric 'Winkle' Brown CBE DSC AFC RN (retired), about his work as a test pilot in 1945 evaluating the operation of the Vampire from an aircraft carrier - the first jet aircraft to achieve this feat. The first flying display of the season was at Abingdon's Air and Country Show in May. Later that month WZ507 displayed at Southend in perfect flying conditions - a huge improvement over the mist and cloud at this venue in 2008! Displays at RAF Cosford, Margate and Roudnice (near Prague) kept us busy in June - we received a last-minute request to take WZ507 to the Czech Republic and Mark Hooton performed several displays there before returning to the UK via Luxembourg. July started well, with two displays at RAF Waddington. However, bad weather forced us to cancel two displays the following weekend, which unfortunately prevented us from appearing at the International Air Day at RNAS Yeovilton and Chelsfield Village Fair - hopefully the weather will be kinder in 2010! August was another busy month, with successful appearances at Shuttleworth, Shoreham and Little Gransden. We have just concluded this year's display diary, with flights at the Spirit of North Weald Fly In, Kemble's Battle of Britain Air Show and the Open Day at Marshall's, celebrating their centenary. With all this activity, it has also been a good year for our annual photographic competition. As with our previous two competitions, the quality of the pictures is once again excellent - I suspect the judges will have a difficult job picking a winner this year! All short listed entries are on our website - more pictures will be added there shortly. 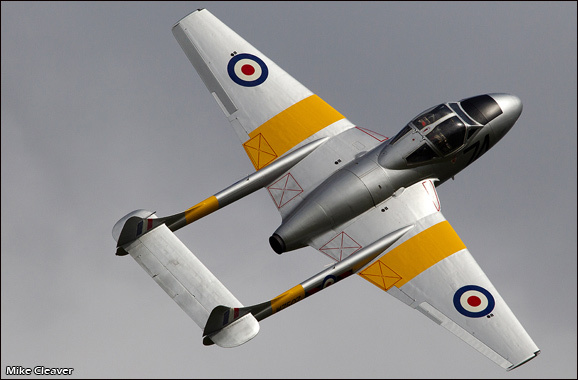 As ever, the prize for the person who takes the best photo of WZ507 will be a flight in the Vampire. To enter, please submit your picture to the VPG via our website - the closing date for entries is 18th October with the winner being announced later this year. More news about this in a later blog! 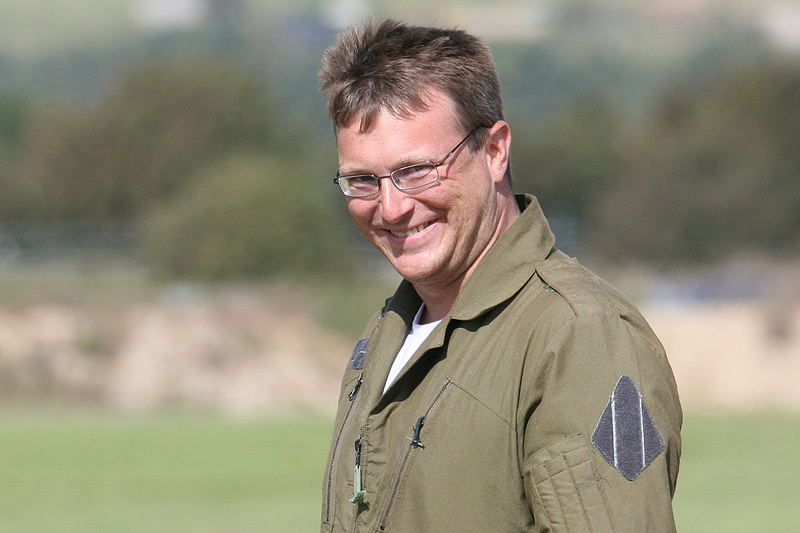 Matt Hampton co-founded the VPG with Mark Hooton in 2005 and is currently the VPG's Chief Pilot. He learnt to fly in 1992 and became a flying instructor in 1995. He instructed at Southampton Airport until 1999, when he moved to Gatwick to fly the ATR 42/72 for Cityflyer Express. In 2003 he transferred to Heathrow and currently flies the Boeing 757/767 on a variety of routes around Europe, the USA, the Middle East and Africa. He has been involved with WZ507 since 2002, learning to fly the Vampire at Bournemouth during 2003. In 2007 he trained to become a display pilot and has been displaying WZ507 ever since - unless the day job gets in the way…!